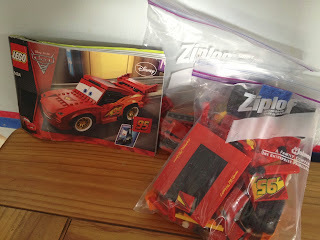 Here is the Cars 2 Lego "Ultimate Build" Lightning McQueen and pit crew Guido from 2011 (Set 8484)! This was the first and only Cars themed Lego set I got. I'm looking to get a few more someday, but there are just SO many of these sets out there. Looks awesome when all put together! If you're interested, browse through these Amazon pages to see many more Cars and Cars 2 Lego sets including those from the regular line and many from the "Duplo" line (great for if you have younger kids who are just getting their first Legos). This set can pretty easily be found online for under $30.